Situated just six minutes’ stroll to Sultan Ismail LRT Station in the heart of Kuala Lumpur, Grand Continental Kuala Lumpur is within two miles to the iconic Petronas Twin Towers. This contemporary sleek hotel boasts an outdoor pool, eight meeting rooms, and a modern gym. Each air-conditioned room is equipped with coffee & tea maker, well-stocked minibar, and satellite television. Free toiletries and hairdryers are found in the private bathrooms. Some accommodations have safety deposit boxes. Grand Continental Kuala Lumpur offers complimentary Wi-Fi access, fax & photocopying, laundry/dry cleaning, and limousine & chauffeur services. There is also a grand ballroom, business centre, and ample parking area on-site. Marble Arch Coffee House serves international-style meals. Side Walk Café offers delectable snacks and drinks. Room service is also available for the guests’ comfort. 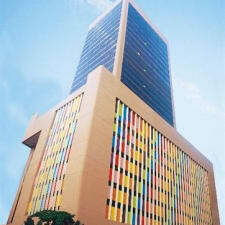 Putra World Trade Centre is a 20-minute walk from this hotel, while Merdeka Square is 25-minute walk away. Suria KLCC is two miles away. Foreign tourists loved this hotel because they get to stay near some of Kuala Lumpur's most popular tourist attractions. The KL Tower, Petronas Tower, and Petaling shopping district are just a few minutes away. The Time Square Mall and the China Town can also be reached within 30 minutes. Guests who were in city for business and for leisure noted that they didn't have to worry about travelling. The hotel has a good access to many public transport options, especially cabs. It also offers many car park options for the guests. Aside from the nice independent restaurant at the ground floor of the hotel, there are also many dining options in the area which the guests appreciated. Famous dining options such as Restaurant Kin Kin, Restoran Kudu Bin Abdul Nasi Kandar Penang, Mohd Yaseen Nasi Kandar, Kedai Kopi Dan Makanan Tai Kong, and Aryan Restaurant are all less than a 20-minute walk away. A lot of previous guests complained that the staff members at the reception area were rude. Aside from the fact that they cannot speak straight English, guests were irritated that the receptionists never bothered to smile let alone greet. Previous guests complained that the rooms assigned to them smelled heavily of smoke even though they asked for non-smoking quarters. Although they were unable to find traces of cigarette, most of them still had to request to be transferred to a different room. The bathrooms in some of the rooms were old, smelly and in dire need of retouching according to guests. They reported seeing mould on the walls, and that the taps and the showers were continuously dripping.